This holiday season finds me once again working in the Rockefeller Center. This time I am in the building with the funny neon sign. Most of the lesser Rockefeller Center buildings put up gaudy X-mas decorations up front: a giant present box, a huge mound of ornaments, and a scary animatronic jack-in-the-box riding a train. 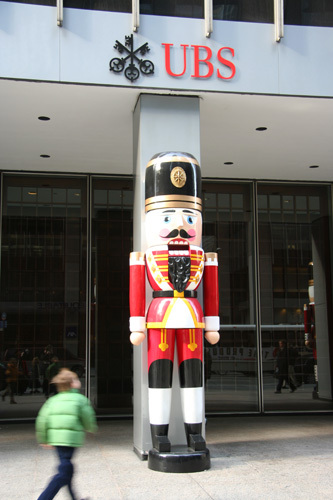 My building has giant nutcracker statues. 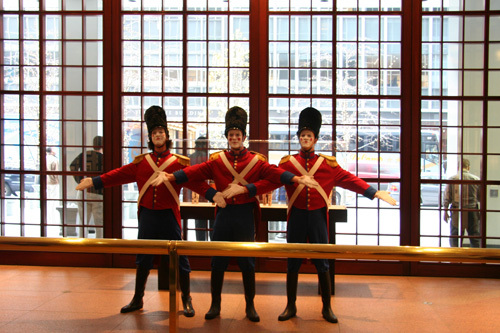 While giant copies of their CO stand outside, in the lobby a trio of toy soldiers sing carols and gesticulate. They seem to be enjoying themselves, well, as much as three costumed men in makeup can enjoy singing carols to an endless procession of salarymen, suits, techies, administrative assistants and other denizens of corporate America. I, for one, is very thankful for a pleasant and interesting new gig and many exciting opportunities, but my thoughts are with those in terrible jobs. Those of you who aren’t happy – there’s always the Internets with wonderful sites like the Joel on Software job board. Still, those of you who think that you are unhappy, I’d like to leave you with a haiku that I made by lightly editing a very real lament of a Burger King worker that I found on Livejournal’s bkstories community. I count BK as one syllable, not two which is probably wrong. I work at BK near Walmart.